Our company is manufacturing superior quality of different dark room accessories like dark room safe lights, cassette pass boxes, film storage boxes, lead chairs, x-ray film dryer & other products and equipment. These dark room accessories are well tested for their quality and confirms to various national and international standards of quality parameters due to our sound infrastructure. We offer Zincalume Steel Tanks to our valuable clients. These tanks are developed and designed using high grade raw material in compliance with industry laid norms and guidelines. Our Mild Steel Storage Tanks are skillfully designed from the finest quality Mild Steel for better performance and longer life. This variety of Storage Tanks is available in varied specifications, in order to fulfill the client’s requirements, that too at very reasonable prices. We are engaged in manufacturing and supplying a wide range of Mol Tanks to our customers. These Mol Tanks are greatly in demanded due to admirable features like its superior quality, durability, corrosion resistance and long service life. We also customized these Mol Tank at most competitive market prices. We strictly adhere to the designs and specifications of our valued clients while fabricating stainless steel tanks. These tanks are made from premium quality raw material like stainless steel and are durable, easy to install, corrosion resistant, high in performance, and offered in different capacities. 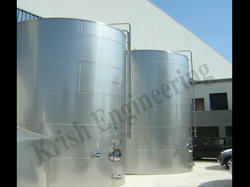 The SS tanks are mainly used in the dairy and pharmaceutical industries. 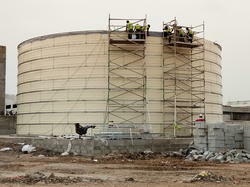 Since our commencement, our firm is engaged to introduce a premium quality array of Steel Tank . The offered tanks are developed in accordance to industry norms and quality parameters.